When service times are longer than usual, it can cost lenders and loan servicers a lot of money. However, to transform loan service lifecycle into a revenue-generating machinery you will need a smart mortgage software suite that can make lending journeys a pleasant experience. And who are you going to get to develop custom mortgage software? We that's who. Outsouce2india offers industry's best AI driven mortgage software development services that are exclusively designed to handle an array of specialized functions. 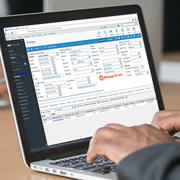 Our mortgage software solutions come with automation features that take care of functions from document management to compliance adherence and everything in between. When you outsource mortgage software solutions to us, we develop a custom software which can readily provide a true omnichannel experience to loan servicers. Using robotic process automation and machine learning we capture high-quality data from documents and store them in a digital document library. It allows lenders and loan servicers to manage digital loan files on the go. We can also develop custom widgets that enable document indexing, auditing, and classification of the extracted data. Our developers can build powerful interfaces between internal and external mortgage systems which includes linking social data. Our integration platform lets you quickly access data for speedier loan processing. This gives a transformative digital experience. To have a 360-degree view of the borrower profile and workflow, we design analytics dashboard using machine learning strategies and robotic process automation so that you can analyze borrower based on past insights and make better decisions. By outsourcing mortgage software solutions, we assure you of worry-free experience because we work according to the SLA and deliver the project within the stipulated time. This would allow you to focus on other core business functions without distraction. Why Choose O2I for Mortgage Software? We are an ISO certified outsourcing company affiliated with the mortgage banker's association (MBA). We use the MISMO framework for capturing data from documents. With strong credibility, we provide a stress-free experience from inception to completion. We routinely work with client's confidential data. We have incorporated security measures that prevent your data from falling into the wrong hands. Our latest security deterrents are not just digital measure, but also a physical one that allows only authorized people to handle your project files. We provide our mortgage software solutions while keeping your requirements in focus. By acknowledging to work within the agreed timeframe, we develop software suites with care and precision because it is our intent to prevent loss of valuable time and money on unnecessary rework. With 20 years of professional experience, we have streamlined our workflow model to deliver timebound projects quickly without delay. Our clients stand by our services because we value their time and we assure to value yours as well. We don't just develop software solutions that are a right fit for the existing challenges. With an eye on the future, we add scalable features that facilities seamless upgrade to a later version, or integration with other third-party systems. The merit of working with our team is that we offer tailor-made services according to your requirements. If you are a budget-conscious, look no further than us because you can avail flexible solutions at cost-effective rates. One of the things that clients expect is a dedicated representative who will not be rotated during or after the project. Whether you need clarification or project updates, you can communicate with us through a single window contact. This way, you can get faster support without shuffling through project documents every time. We have a team of highly qualified software architects, developers, and managers who carry 10+ years of experience in agile development, backend integration, and development blueprinting. Our team is also well-versed with the mortgage compliances to deliver results that are nothing short of your expectations. Our infrastructure equips the latest technologies that cut the time between project outsourcing and delivery. We have the latest development tools and access-controlled data storage facilities where your project is securely handled by our professionals. When you have to send project files in a safe way, we got you covered. Our secure FTP allows you to send sensitive project files with minimal risk. We are a company which works 24/7. You can reach us through a phone call or email irrespective of the geography or time zone. US based customer approached O2I, as his in-house team of underwriters was not able to manage the increase in volume. We provided him with a dedicated team of underwriters and helped him get business back on track. A valuation company owner experienced a 25% increase in business and 50% cost reduction with mortgage valuation services provided by Outsource2india. Outsource2india is an ISO certified mortgage services outsourcing company with 20 years of experience under the belt. We have had the privilege of serving some of the best mortgage clients around the world. We provide customized mortgage software solutions that handle multiple functions in mortgage services with surgical precision. Our team of experienced developers has been responsible for several successful mortgage suites.